One of the MLNA’s two annual social events, the Spring Fling brought neighbors together on a Saturday morning in early March, but it will not be held in 2019. Chat with old friends and meet new neighbors. Enjoy free baked goods, hot cider or chocolate, and Starbucks coffee. Buy some books at the PTA’s used-book sale on the stage. Learn about emergency preparedness from the members of our CERT (Community Emergency Response Team). Donate small stuffed animals to Animals Beacons of Light. Learn about our city from members of its Community Outreach team. Visit the Neighborhood Watch/Police Department table for crime-prevention tips and info about the MVPD’s social-media outlets. Consult members of Mountain View Trees about their tree questions. Learn about the city’s aquatics program. Pick up a welcome packet if they are new in the neighborhood. Learn about Rebuilding Together Peninsula. See more of Monta Loma’s history at the Monta Loma History display, including the scrapbook kept by one of the MLNA’s co-founders. 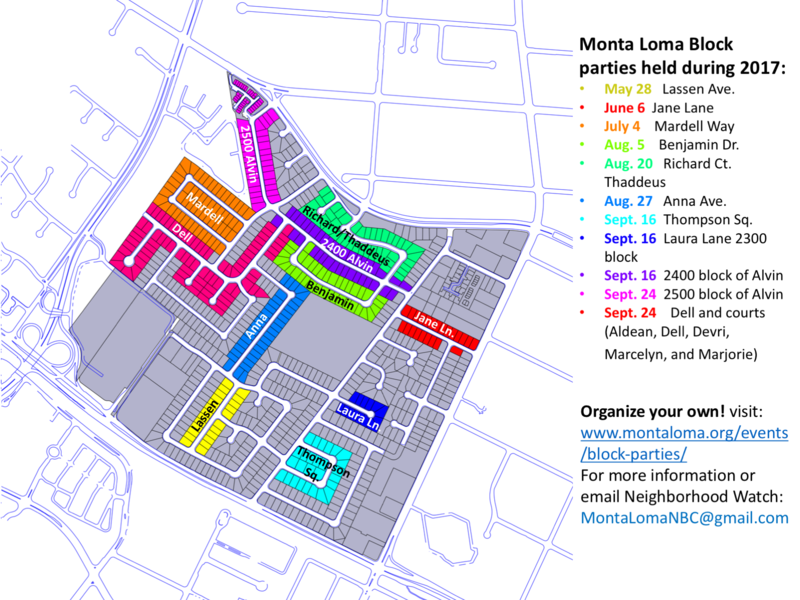 Check out the new block-parties map. Buy a Monta Loma tee shirt. Let their kids engage in a craft project at the crafts table. Have their questions about the residential food-scraps program answered. See photos of the 2017 event here and the 2016 event here. Our other annual social event is the Ice Cream Social in late August. Click here for photos of the 2017 event, and here for photos of the 2016 event.